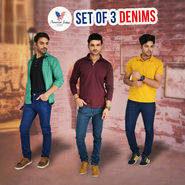 Men's Jeans have always played an important role in their wardrobe, They are one of the universal casual outfits for men in the world since decades that provides extreme comfort and looks very stylish when teamed with contrasting Tees and casual shirts, Jeans for men's are one the most comfy and fashionable clothing item that can greatly transform their appearance into something more stylish, There are innumerable fashion brands that offer men's trendy casual pants in a host of designs, styles, fabrics and colors. You can get them at great price from Naaptol.com, one of the largest retail megastores in India, besides earning several discounts and other benefits. If you are an avid fashion follower and looking for right bottom wear for the weekend outing then you are absolutely at the right place. Naaptol presents an exclusive collection of men's denim jeans that won't let you compromise with your style. These jeans will surely garner you with loads of admirable compliments from your friends and other acquaintances and will make you stand out of them enhancing your overall look. 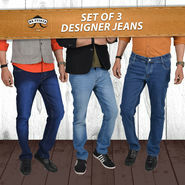 Men fashion jeans today come in various fits from boot cut to relaxed ones, from straight to slim. These jeans can be stylishly worn at home, to college, office, on holidays and also in different occasions. Whatever style you like, we have the finest range of the same for you. You will go crazy with our amazing jeans collection from various well-known brands like Levis, Wrangler, Lee, Spykar, Pepe Jeans, and many more. 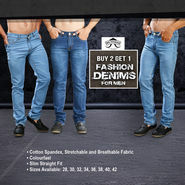 Browse the Men's Jeans section to find the right bottom wear for you or for your dear ones. Naaptol is an ultimate shopping destination where you can find the best of fashion products for yourself at a single platform, thus having a pleasure of blissful shopping experience. So, shop today and enjoy great discounts and other benefits.